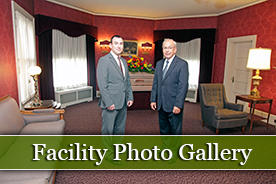 Holman’s Funeral & Cremation Service has been serving Portland since 1854. Located at 2610 SE Hawthorne Blvd Portland, Oregon 97214. We are near downtown Portland and easily accessed by Tri-Met public transportation. For your convenience, our facility is handicapped accessible and offers ample parking. Our chapel seats 150 people, so all of your guests will be able to sit comfortably at the service. Please call 503-232-5131 for directions or to set up a tour of Holman’s.